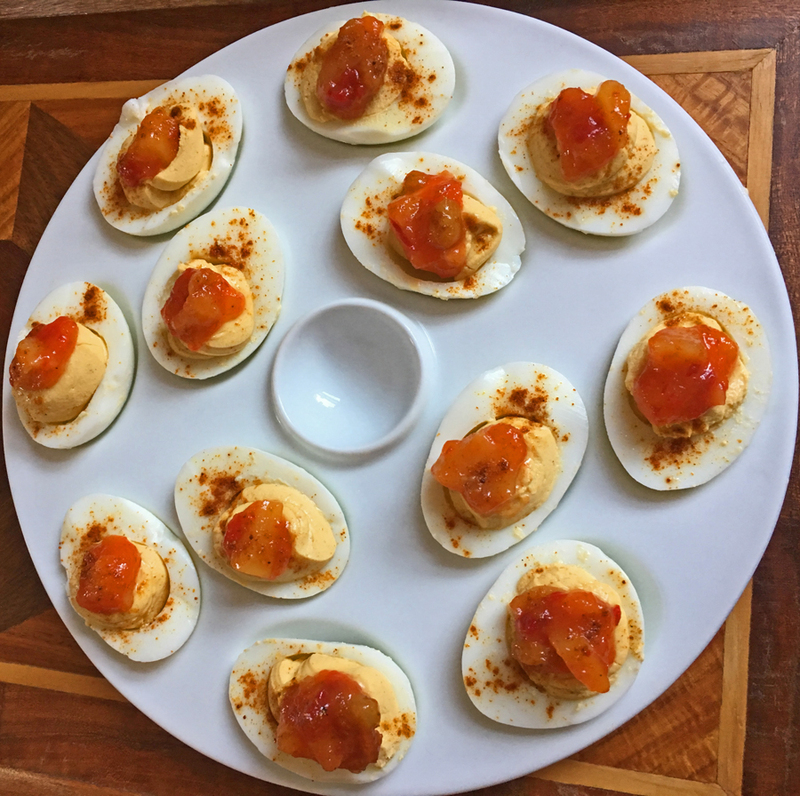 Better The Devil You Know...Deviled Eggs | Let's Cook With Bry! Better the devil you know…than the devil you don’t. Which means that it is often better to deal with someone or something you are familiar with and know. 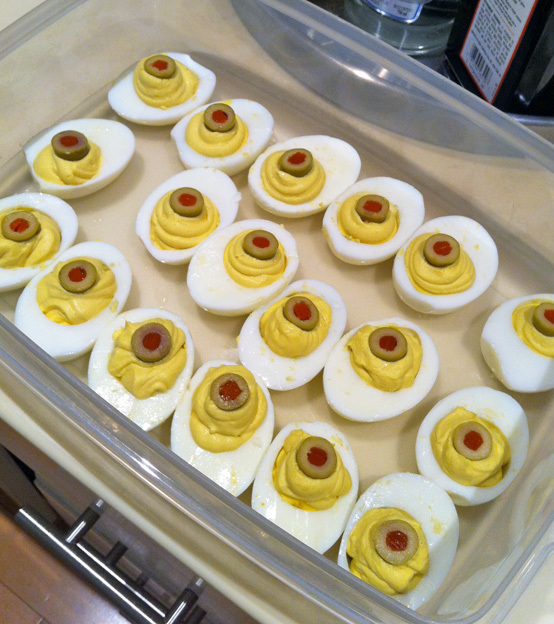 Well, I know how to make sinfully delicious Deviled Eggs, and I make them frequently! 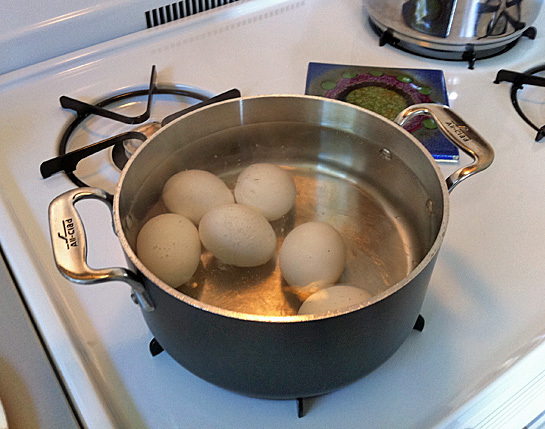 Place 6 – 12 eggs (I make a ton of them, they always get gobbled up) in a pot of cold water, covering the eggs with an additional half-inch to inch of water (you can salt the water if you like). Heat over medium-high heat. Meanwhile, prepare the cold bath for the eggs: chill a large bowl full of water and ice cubes in the refrigerator or freezer. When the water JUST BARELY BEGINS TO BOIL, cover the pot, turn the burner off (or remove from an electric burner) and set your timer for 14 minutes. After 14 minutes, in the ice bath you go! 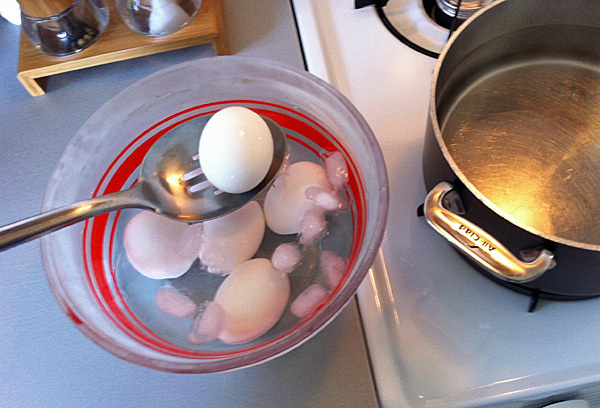 When the timer goes off, remove the eggs from the pot with a slotted spoon and plunge them into the ice water bath, and let them sit in the refrigerator until cooled. Now you’ve got perfectly cooked hard-boiled eggs that will not be rubbery! Peel the eggs, half them (I use a small paring knife and cradle the egg in the palm of my hand – YOU use a butter knife instead so you don’t cut yourself! ), and set the whites aside. If you don’t have a deviled egg plate (which I do not either), shave a very thin sliver off the bottom of the egg white so that it will sit upright. Now comes the part that is only completed by tasting/trial and error (hopefully more the former than the dreaded latter). With a fork, mash the yolks in a bowl, and for 9 eggs, mix in (ROUGHLY – start out conservatively and + or – depending on the quantity of eggs): a quarter cup of mayonnaise (REAL mayonnaise, not Miracle Whip, and I use the lowfat kind, it tastes just as good), one tablespoon of yellow or dijon mustard, one tablespoon of white or rice wine vinegar (or lemon juice), a teaspoon of salt, and a dash of white pepper. Mix until a coarse paste, then transfer to a food processor or blender, and blend / stir / blend / stir / blend until the consistency is silky smooth. Transfer the yolk mixture to a plastic bag (I use a small sealable bag so I can get all the air out of it, and I first insert it into a rocks glass with the zipper part of the bag wrapped around the outside of the cup, which makes it easier to get all the yolk into the bag), then cut a corner off the bag. Using it like a pastry bag, gently squeeze the yolk into each egg white – it doesn’t have to be all pretty like a wedding cake, just consistent, it’s really not difficult. Garnish each one by halving small green (Manzanilla) olives w/pimentos and placing atop each egg with the cut side facing up. 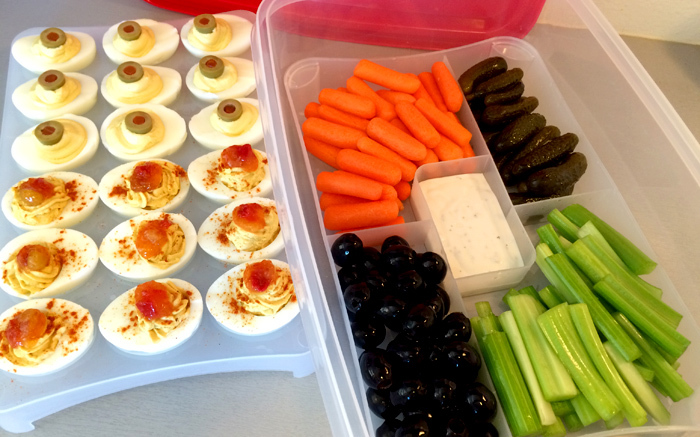 You can try variations, like adding or substituting: bacon bits and wasabi; pickle relish; curry; or whatever might complement your picnic, cocktails, or dinner. Garnishing can be just as varied and fun, with dill sprigs, parsley, minced chive, golden raisins (for curried eggs), or a sprinkling of paprika. EVERYBODY will devour them, I guarantee!